Is a common, non-contagious infection of the gums with sudden onset. The main features are painful, bleeding gums, and ulceration of inter-dental papillae (the sections of gum between adjacent teeth). This disease, along with necrotizing (ulcerative) periodontitis (NP or NUP) is classified as a necrotizing periodontal disease, one of the seven general types of periodontitis. The often severe gingival pain that characterizes ANUG distinguishes it from the more common chronic periodontitis which is rarely painful. 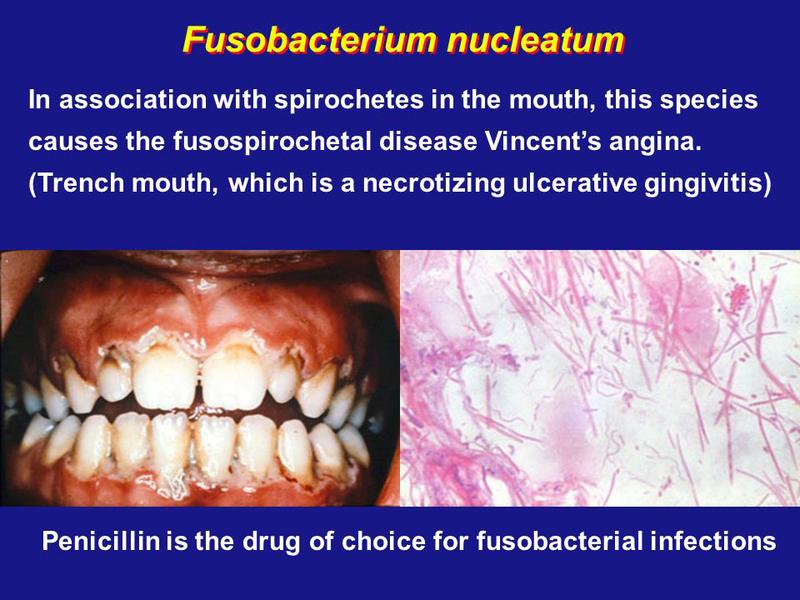 • ANUG is the acute presentation of necrotizing ulcerative gingivitis (NUG), which is the usual course the disease takes. If improperly treated or neglected, NUG may become chronic and/or recurrent. Predisposing factors include poor oral hygiene, smoking, malnutrition, psychological stress and immunosuppression (sub-optimal functioning of the immune system). • When the attachments of the teeth to the bone are involved, the term NUP is used. In the early stages some patients may complain of a feeling of tightness around the teeth. • Profuse gingival bleeding that requires little or no provocation. • Interdental papillae are ulcerated with necrotic slough.The papillary necrosis of NUG has been described as "punched out". ►Other signs and symptoms may be present, but not always. • Oral malodor (intraoral halitosis). • Bad taste (metallic taste). Malaise, fever and/or cervical lymph node enlargement are rare (unlike the typical features of herpetic stomatitis). Pain is fairly well localized to the affected areas. Systemic reactions may be more pronounced in children. Cancrum oris (noma) is a very rare complication, usually in debilitated children. 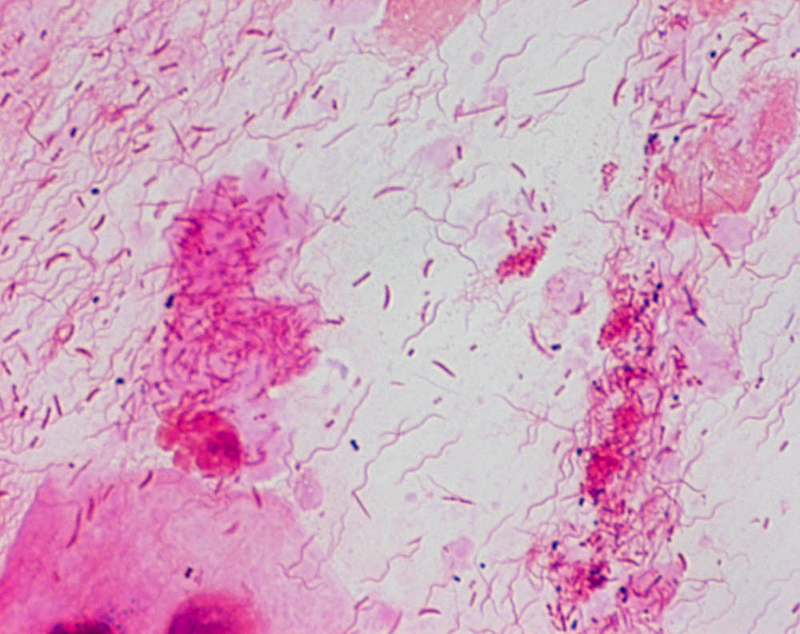 Similar features but with more intense pain may be seen in necrotizing periodontitis in HIV/AIDS. 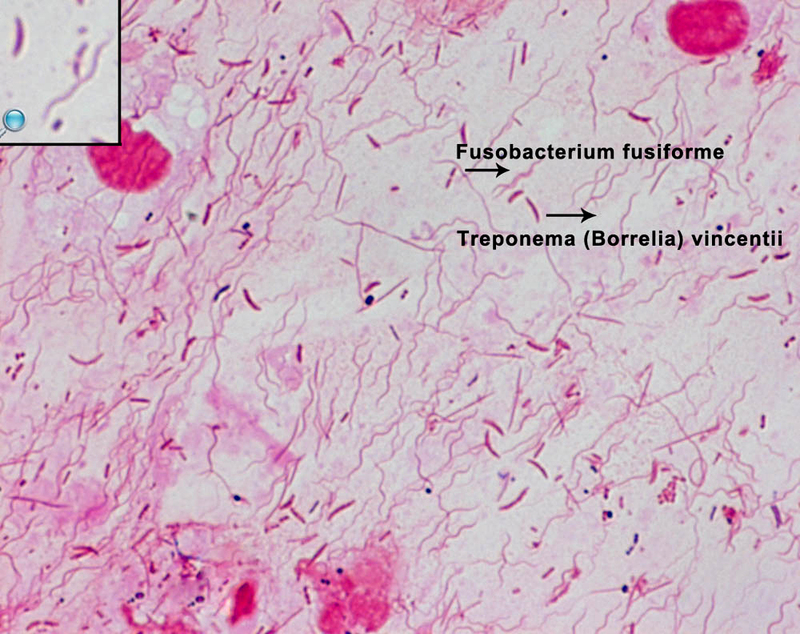 Necrotizing periodontal disease is caused by a mixed bacterial infection that includes anaerobes such as P. intermedia and Fusobacterium as well as spirochetes, such as Treponema. Diagnosis is usually clinical. 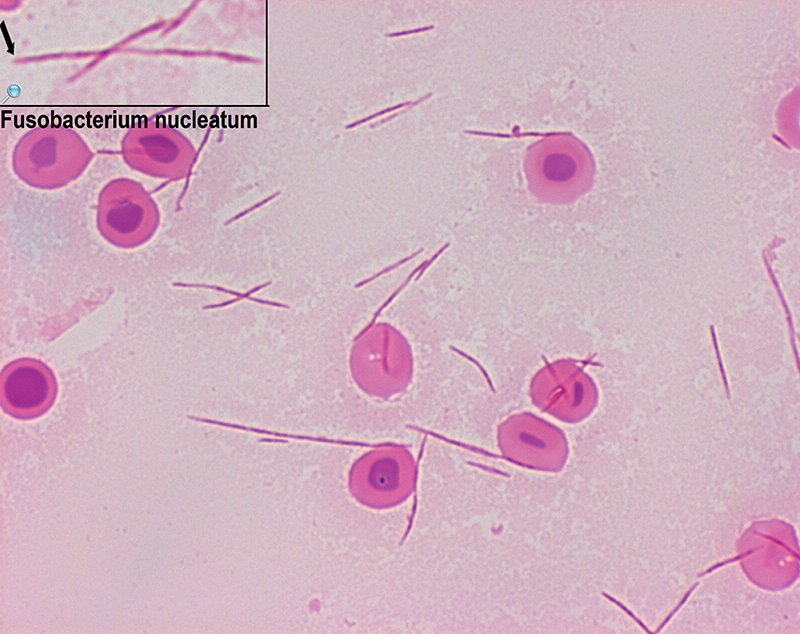 Smear for fusospirochaetal bacteria and leukocytes; blood picture occasionally. Treatment includes irrigation and debridement of necrotic areas (areas of dead and/or dying gum tissue), oral hygiene instruction and the uses of mouth rinses and pain medication. If there is systemic involvement, then oral antibiotics may be given, such as metronidazole. 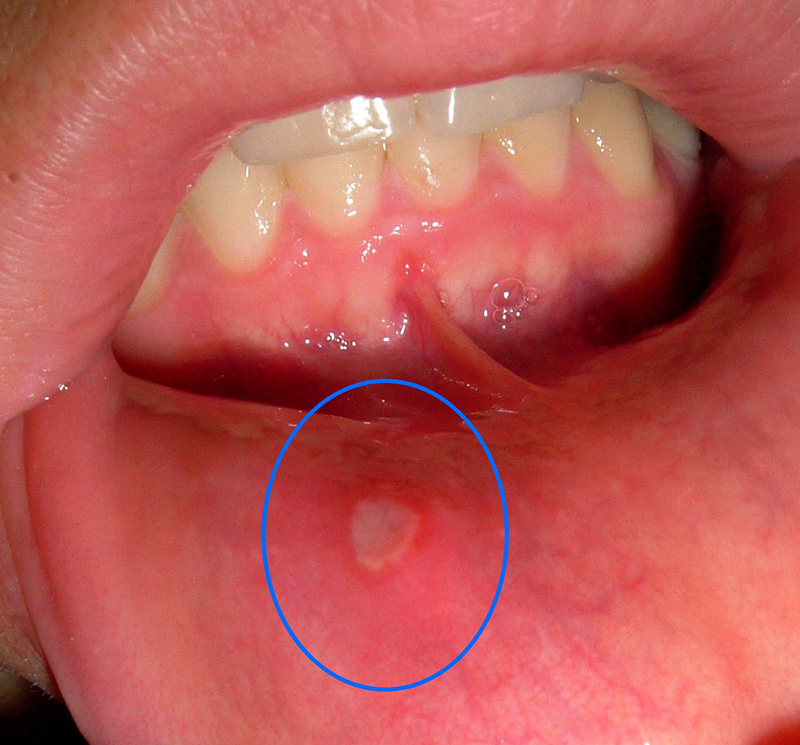 Untreated, the infection may lead to rapid destruction of the periodontium and can spread, as necrotizing stomatitis or noma, into neighbouring tissues in the cheeks, lips or the bones of the jaw. 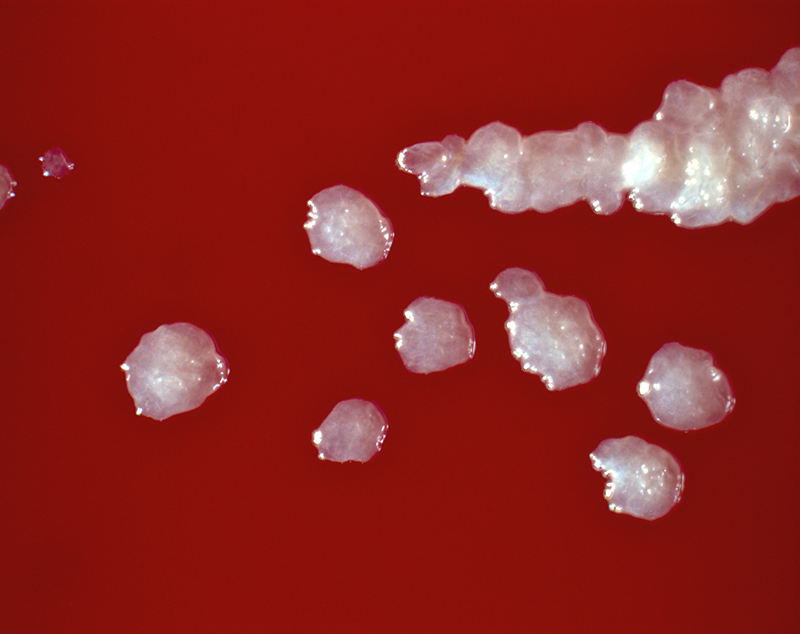 As stated, the condition can occur and be especially dangerous in people with weakened immune systems. This progression to noma is possible in malnourished susceptible individuals, with severe disfigurement possible. Necrotizing ulcerative gingivitis has been observed for centuries. 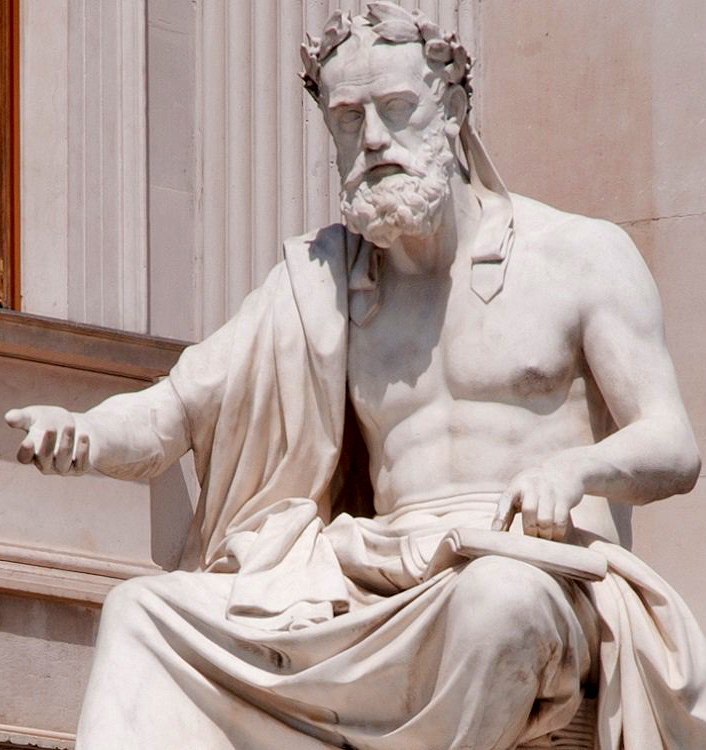 Xenophon observes sore mouth and foul smelling breath in Greek soldiers in the 4th century BC. 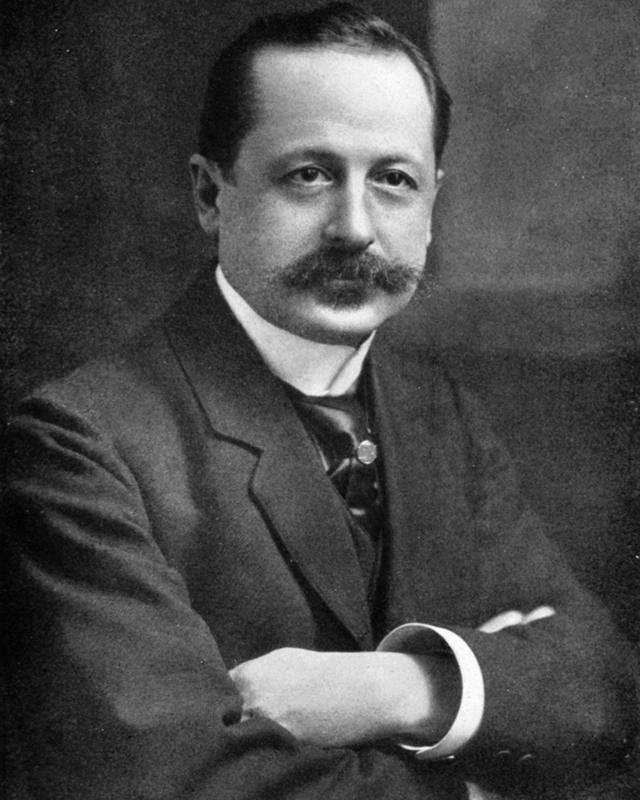 a French physician working at the Paris Pasteur Institute describes a fusospirochetal infection of the pharynx and palatine tonsils, causing "ulcero-membranous pharyngitis and tonsillitis", which later became known as Vincent's angina. 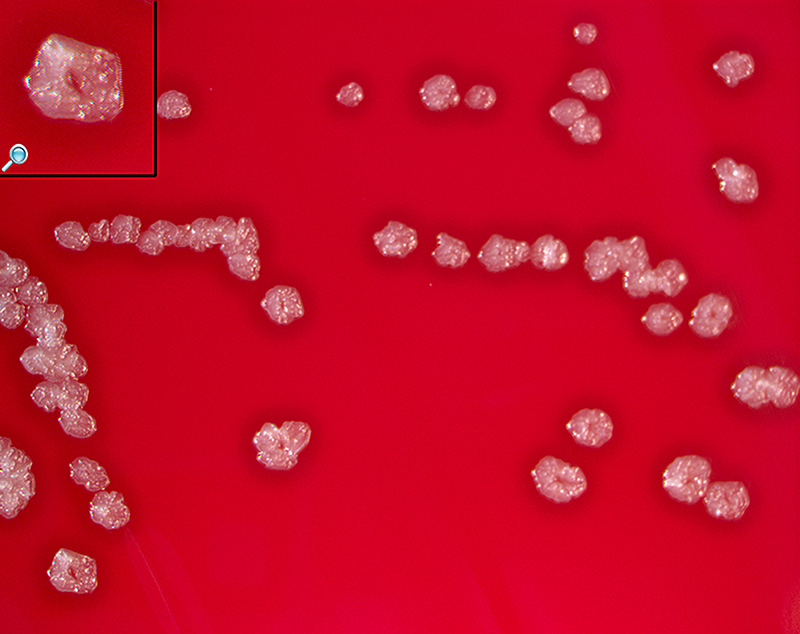 Later in 1904, Vincent describes the same pathogenic organisms in "ulceronecrotic gingivitis". 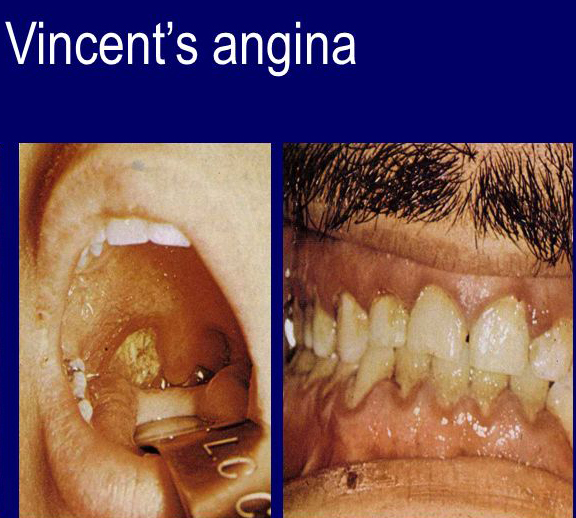 Vincent's angina is sometimes confused with NUG, however the former is tonsillitis and pharyngitis, and the latter involves the gums, and usually the two conditions occur in isolation from each other. 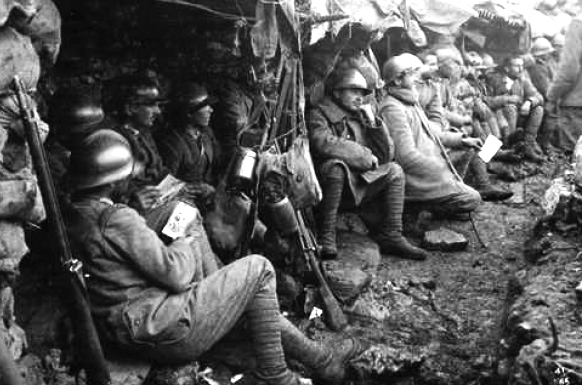 The term trench mouth evolved because the disease was observed in front line soldiers during World War I, thought to be a result at least partly because of extreme psychologic stress they were exposed to. The same condition was appearing in civilians during periods of bombing raids, who were away from the front line, and who had relatively good diets during wartime due to rationing, so it is assumed that psychologic stress was the significant causative factor. It has also been associated with high tobacco use in the army. 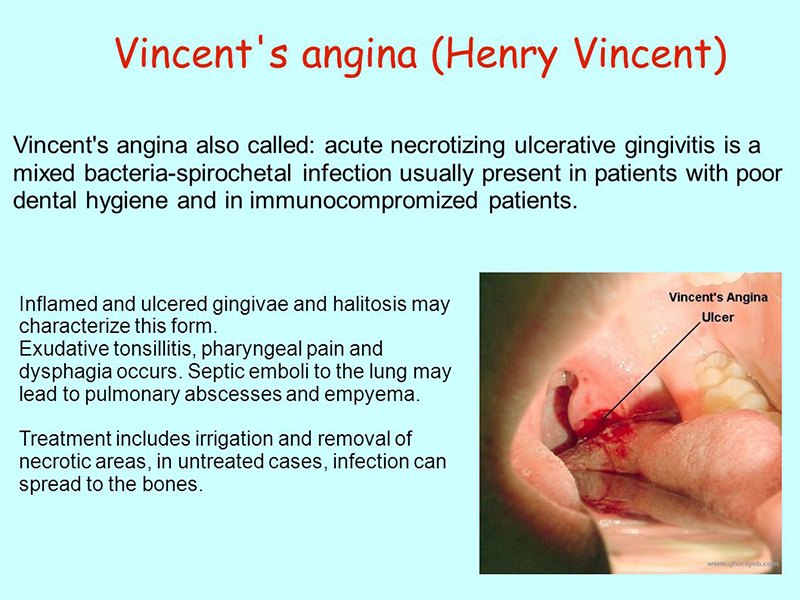 Many other historical names for this condition (and Vincent's angina) have occurred, including: "acute membranous gingivitis", "fusospirillary gingivitis", " fusospirillosis", "fusospirochetal gingivitis", "phagedenic gingivitis", "Vincent stomatitis", "Vincent gingivitis", and "Vincent infection". 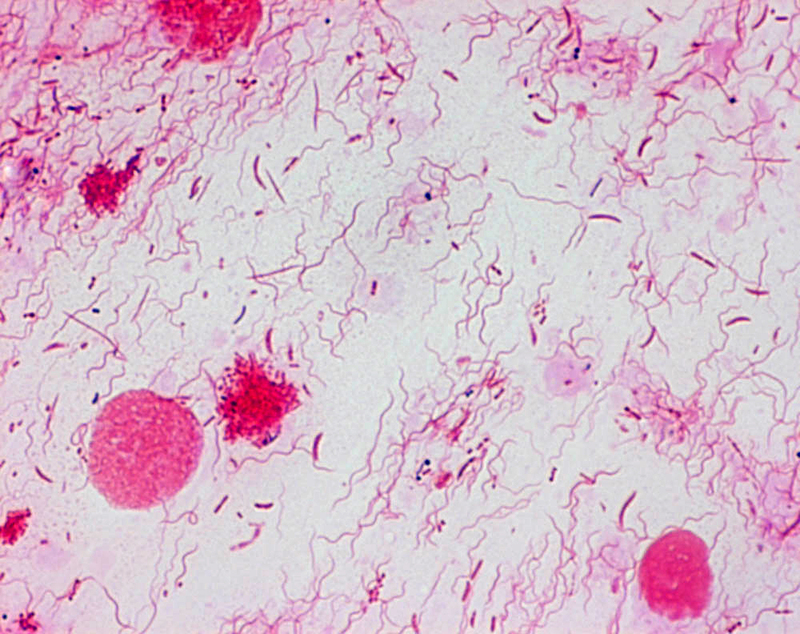 In the late 1980s-early 1990s, it was originally thought that some necrotizing periodontal diseases seen in severely affected AIDS patients were strictly a sequela of HIV, and it was even called HIV-associated periodontitis. It is now understood that its association with HIV/AIDS was due to the immunocompromised status of such patients; it also occurs with higher prevalence in association with other diseases in which the immune system is compromised.